Clean Air in London (CAL) announces its second annual Clean Air in Cities Awards which recognise individuals who have made a valuable personal contribution to improving air quality in London and elsewhere. The London Air Quality Network, operated by King’s College London, receives a special mention. “The Clean Air in Cities Awards 2014 recognise 24 people who have made a valuable personal contribution to improving air quality in cities including London. “It is impossible to single out any one person or organisation. However, the London Air Quality Network deserves a special mention for leading action on air pollution for more than two decades. It therefore becomes the first organisation to receive a Clean Air in Cities Award. “Clean Air in London is also pleased that John Tomlinson has accepted an invitation to become an Honorary Founder Supporter of Clean Air in London. As retiring Chairman of the City of London Corporation’s Port Health and Environmental Services Committee, John has led work in the lead up to 60th anniversary of the first Clean Air Act which was introduced for the City of London Corporation on 5 July 1954. Mr Tomlinson joins others who have been Honorary Founder Supporters since 2007. The Clean Air in Cities Awards 2014 aim to broaden and deepen the impact of the Clean Air in London campaign by recognising those who have made a valuable personal contribution to improving air quality in cities including London. Existing supporters, sponsors and clients already make such a contribution and so have not been eligible for an Award. CAL aims to present the Awards annually. 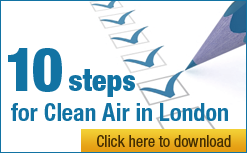 Clean Air in London will be pleased to present many of the Awards personally in coming weeks.